In the last couple of months I’ve been picking up this Tesco brand orange fruit drink whenever I could find it. It costs less than 5 ringgit per 1.5 litre bottle. The listed price is RM4.89 but they occasionally have discounts. That’s 20%-30% cheaper compared to other brands. Last year there were some “orange juice” wars in the newspapers. Remember those ads claiming that they were the real “orange juice” while others were only “orange fruit drink”? Well this Tesco brand is obviously an orange fruit drink. I have no illusions about this being healthy or natural. But it’s comparable in flavour and texture to Peel Fresh, with orange sacs included. The Tesco near our home doesn’t seem to have them in stock anymore, I found these at a second Tesco store. They are not found in the refrigerated section. You need to look at the cordials / syrups aisle and keep your eyes on the bottom shelf. They also have apple and blackcurrant juices. The apple juice is a bit too watered down for my liking. I haven’t tried the blackcurrant. One of my favourite places to have my lunch is the rojak stall that operates near my office. The stall operates from the side of a motorbike. The owner suddenly decided to setup business near my office and I couldn’t be happier. Since then I’ve had lunch at the stall at least once a fortnight if I wasn’t having a sore throat. In the beginning they hardly had any customers, but nowadays I have to be lucky to find a seat. Frequently I have to share a table with strangers. My usual order is mee rojak dengan cendol biasa. 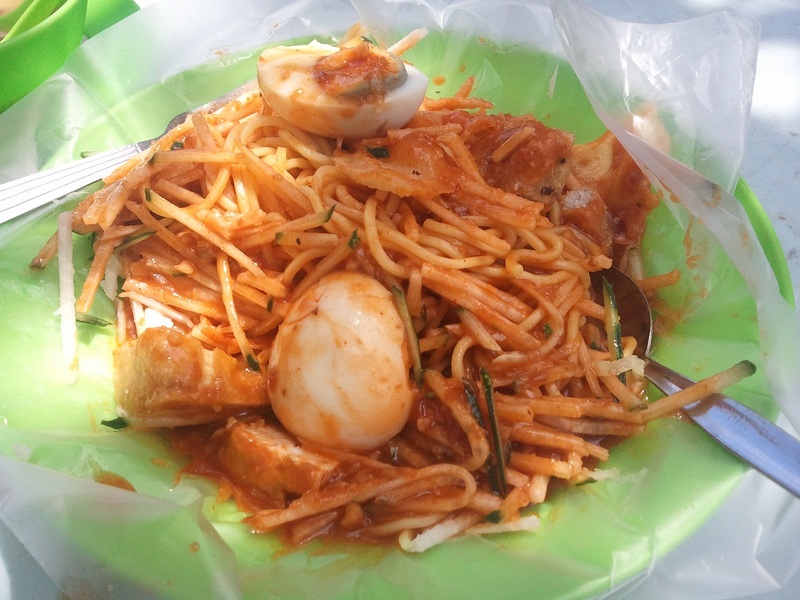 This is a closer view of the mee rojak. My usual style is to finish the noodles and the taufu first. I keep the boiled egg for the satisfying ending. Nowadays it costs RM5.50 for a rojak and cendol combo. I find it pretty relaxing to sit under a tree and have this meal. A lot of my colleagues walk past but strangely not many of them stop to eat at the stall. Maybe they don’t feel like having it for lunch, or maybe they doubt the hygiene. I’ve also noticed that the rojak and cendol brings people from all races together. It’s a food that is acceptable and non-taboo so I guess everyone can enjoy it. Sometimes I sit with strangers and we exchange smiles or help to pass the tissue even when no words are exchanged. 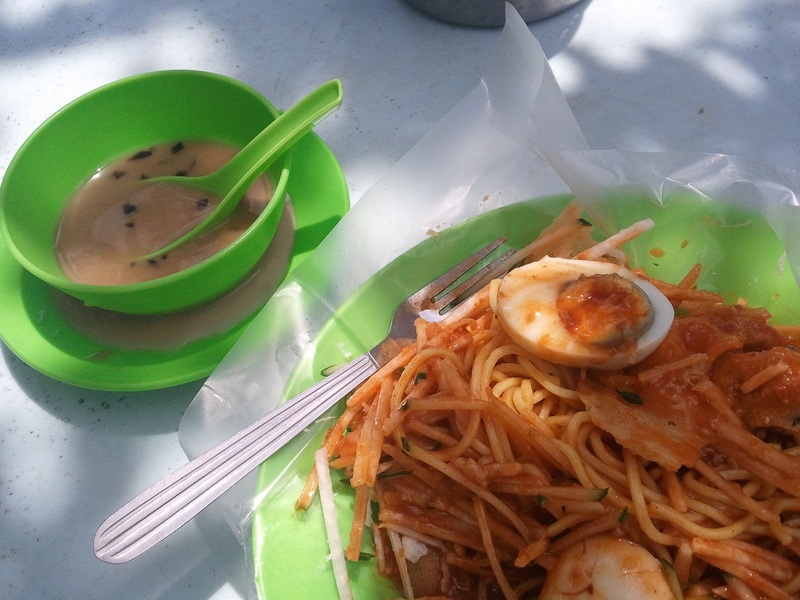 I just have to control myself from eating too much of the peanut sauce… sometimes the combination of peanuts and the coconut milk in the cendol gives me stomach ache. Last month Poey Chin and I had a rare opportunity to hang out at the mall because we both had a day off. We would usually try to catch a movie but there wasn’t anything good in the cinema. Nowadays we visit Paradigm Mall quite a lot. At least once a week, but frequently twice a week. What to do? It’s so near our home haha. At the beginning I was not so keen to go there. When it first opened there were so many problems such as missing signage, sewage smell, lack of rest areas and confusing elevators. Thankfully all that has been fixed. There’s so much improvement now and so many restaurants have opened there. One of the restaurants we wanted to try was Plan B because we saw a lot of interesting photos on Facebook. We sat down at one of the middle tables near the counter and ordered our food. The servers were rather efficient. We were seated and attended to immediately. They even brought us a (free) bottle of water. That’s a very nice gesture. Just for that alone, I would go back there. 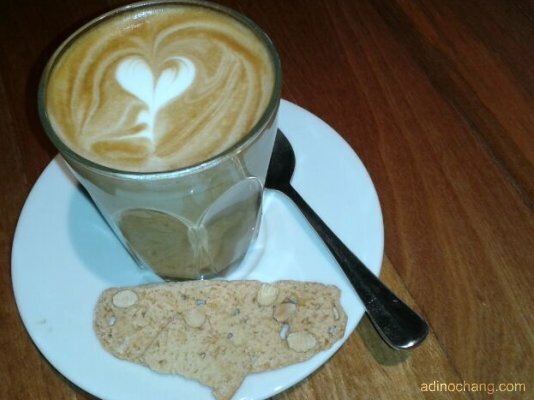 We ordered a cup of coffee and it was nicely decorated with a heart and came with a biscoti at the side. I ordered a club sandwich which was really good. 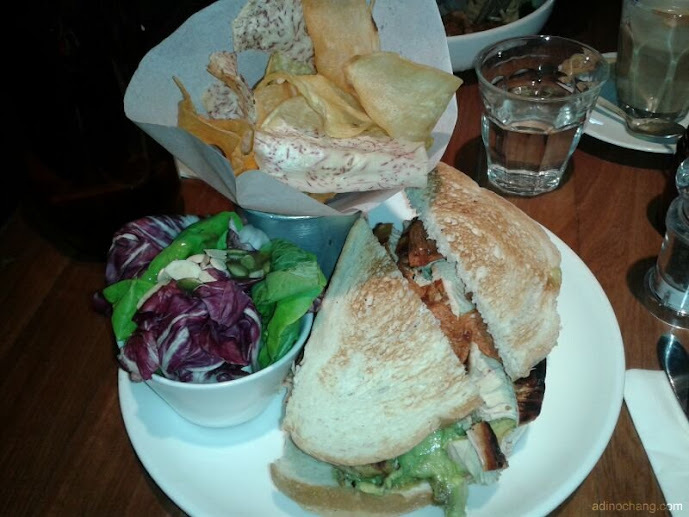 The sandwich is a piece of grilled chicken with bacon and vegetables between slices of toast. The sides are deep fried potato / yam and a salad. The chicken was juicy and moist and the portion was enough for a big eater like me. 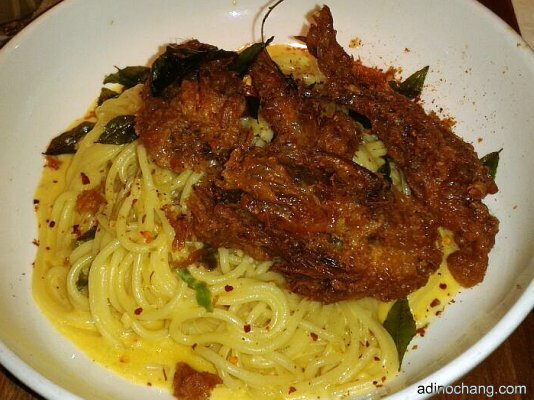 Poey Chin ordered a soft shell crab pasta. The pasta and sauce was good and the highlight was the crab, It was deep fried, spicy and salty which made the dish really appetizing. Oh God it was so long ago (and I admit I’m forgetful) so I can’t remember the prices, but it’s quite reasonable. The bill for our lunch was probably under RM50. I enjoyed our dining experience though the servers could improve their communication and table-side skills. Our server wouldn’t make eye contact with us at all, and I saw another server actually fidgeting impatiently with his pen when another table was ordering. Maybe instead of fidgeting he could suggest some items for them to try. But no big deal, because the food was delicious and reasonably priced.